When you come to the edge of all that you know, you must believe one of two things: There will be earth to walk on, or you will be given wings to fly. I love your website, Patrick! It is refreshing to read someone else’s views on subjects you already love – and write about them in such an interesting and invigorating way. I too love the tarot – I own quite a few decks and love to compare the images and interpretations of each. 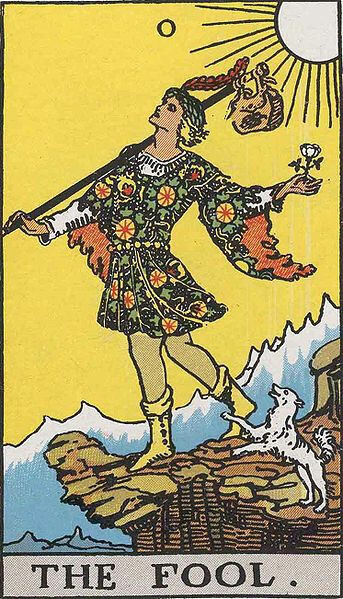 I often think about Carl Jung’s work on dream images when working with the tarot. I love Laurie Anderson, Kate Bush, Jane Siberry, Peter Gabriel, Talking Heads, Jaz Coleman (have you heard his classical version of The Doors “Riders of the Storm?”), Alison Krauss (especially her collaboration with Robert Plant), My Morning Jacket, Dresden Dolls, PJ Harvey, Imogen Heap, Radiohead, Lowell George, Warren Zevon, The Subdudes, the list goes on and on.